If you have plans on going to China for vacation, or living there for any length of time, you will need to prepare to visit the Great Firewall of China. Visiting this tourist attraction is mandatory! As most people know, many websites are blocked in China. Mostly websites related to social interaction such as Facebook, Twitter, Google+ and most the popular blogging platforms such as Wordpress and Blogger (which means if you are reading this, you are either not in China, or you have already figured out a way to bypass the Great Firewall of China. I have lived in China now for a year and have tried many different tools to try to use the internet freely. I have tried various VPNS, Hotspot Shield and Freegate. The best (and freest) is Freegate. VPNs are fine, but getting a good free one is next to impossible. Most people pay a monthly or yearly fee in order to use a good VPN. That being said, if you don't mind paying $5-$15 a month, VPNs are great ways to go. You can use a VPN in both Windows or Linux. 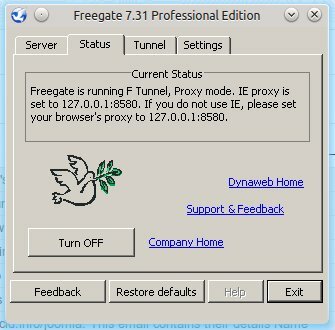 Freegate is wonderful! The Chinese version is called 自由门 ziyoumen, which means Freedom Gate. That is exactly what it does. Aside from being free in price, the software is completely free with no annoying ads or other caveats. If you plan on going to China for vacation or employment, I strongly suggest that you go to their website and download their executable. After you have done that, you can change the file name extension or zip it using 7zip and email it to yourself so that you have access to the file while in China (and so you can help your friends in China install it as well. I often forward that email to my friends here so they can use Freegate as well). Freegate runs as a simple executable. Just find a folder to run it in and double click. In Windows it is easy and straight forward. My favorite things about Freegate is that it runs very well in Linux using Wine! 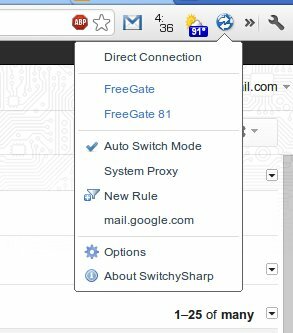 If you do plan on using Freegate in Linux, you will need to use something like ProxySwitchy or something similar in Firefox or Chrome (or you could always configure the whole system to use the proxy, but I prefer just putting a proxy on the browser). Here is the icon for SwitchySharp. This is a plugin for Chrome that allows me to pick and choose the sites I want to use the proxy for. 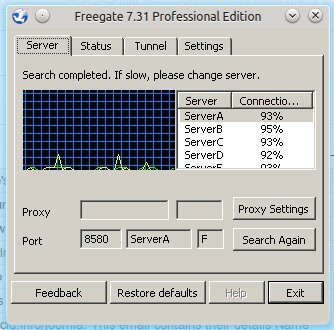 I will say that Freegate definitely works better in Windows than in Linux. Every once in a while in Linux, it will crash or have to be reset. Not a big deal. Freegate has certainly made my life in China much better. It is the reason I am able to post on this blog in the first place! I've used the Pure VPN for a long time to unblock web sites, online streming, Play online games and VOIP. I also have many friends in China who use it also. Voice quality is excellent and customer service is great for times when you need a little help. to access Netflix, and it is working awesome. I prefer Primovpn(http://www.primovpn.net ). Fast servers in more than 60+ countries. Works for me.